You must defend your people and better not fail, The Sultan already knows that you're in his oasis, his troops are on their way, gather some resources and deal with Sultan's mercenaries. Folks, the maps are getting scarcer every year. Perhaps some comments might encourage the dwindling uploaders. 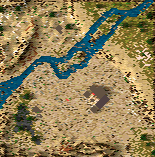 This map is well-made with very authentic landscaping. I enjoyed playing it... racing against the timer... but nothing happened when the timer ran out and Victory was therefore easy providing you repelled the few invasions. I feel that being able to buy stone & iron is a mistake, and would recommend removing that. This would make for a much longer game & you could then add a few more invasions. I hope to see more eco-vasions from you. An optically nice scenario but very easy to handle, and no problems to fulfill the required iron and stone objectives. Could be in deed way tougher, thus, you should not allow to trade. The few small invasions are easy to repell.